I get lots of water problem phone calls like this all during our rainy season. This is all through March and through July. This could be a sign of a leaking chimney. I found some interesting rain fall statistics for here in Cincinnati. Did you know that our heaviest rainfall herein Cincinnati occurs during the month of May, with over 5 inches rainfall. The month of June is 2nd and has over 4” of rain. The months of March, April, and July are darn close to tying at 3.86 rainfall. Cincinnati has on the average 132 days rain that brings us 42 “1/4 inches of rain For a little comparison of a few other cities Portland, OR has 39” and Seattle, WA comes in at about 38”. Atlanta comes in at 48 inches and Orlando Florida is just a touch over 53 inches.That is almost 41/2 feet of rain. *It is my opinion that almost in all residential interior water problems are…One of (Three) possibilities Area of concern. 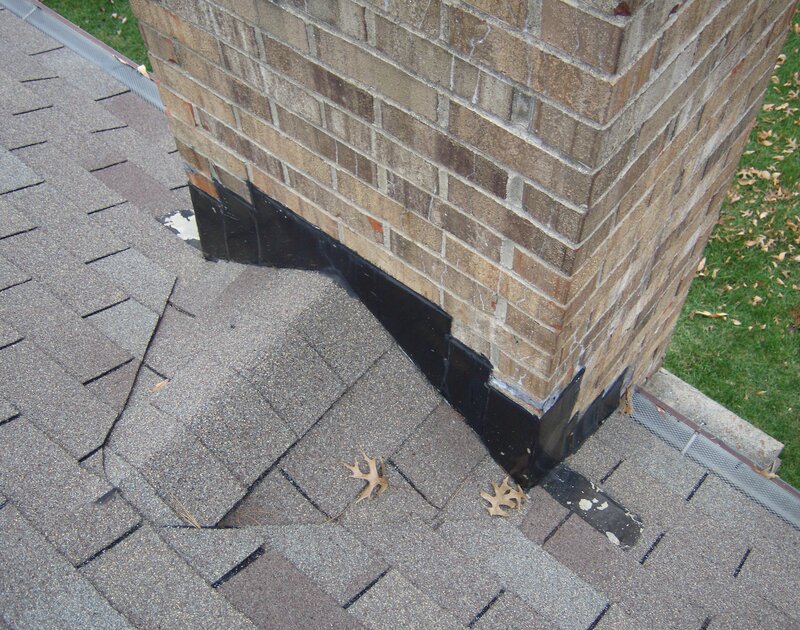 My 1st Area of concern is what I’ll refer to as the “Roof top area” Starting from the top of your roof it heir could be damaged or actually missing shingles. There could also be water entry through popped nail holes on the wood decking where the shingles were once installed. Did you know that just one little hole could allow gallons of water into your home? There are a number of roof penetrations that may be problematic, such as those rubber boots around those short plumbing vent stacks, these could be cracked or worn out from the sun. Roof vents are those square looking vents are required to exchange the air in our homes and attics. 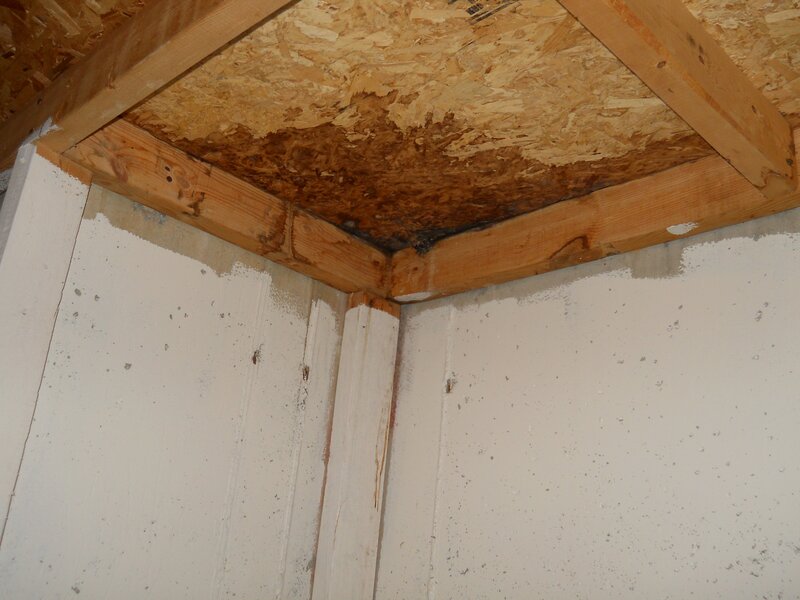 Whole house attic fans, Sky lights and window lintels flashings may need to be re-calked or replaced or weatherized. There is metal valley flashing on the rooftop that can be found at every angle, rise or dimension of the rooftop shape. There is term called Ice Damming this is where in the winter ice is collecting in the gutter and as it melts on those sunny after noon it refreezes as the sun goes down, but the problem here it that it starts to accumulate and backs-up under the shingle and now is again freezing and melting and then dripping into the attic, then down into the ceiling in your bedrooms or living room of your home. A crickets this is a pyramid design that flush rainwater around the backside of a chimney and into the gutter. Then there is the chimney flashing this is a metal collar that fits around the chimney that may have rusted out or damage by raccoon working to pull it back as they are making entry into your attic or maybe tree branches may have been rubbing against it. Metal chimney flashing wraps round the shape of the chimneystack preventing rainwater entry that is running down the roof top shingles. … Honeys get the buckets it is raining in the living room; all over new Flat screen TV ! .. Just Fix It , is what I hear the most! -Starting at the top of the chimney, it maybe called by a number of names. Such as the crown, cap, crown wash, splay. If its made of metal it is refer to a as a metal chase cover. -The Crown of the chimney must be watertight. .
One of the biggest problems we see, is that during the rapid construction days of the 70’s, 80’s and 90’s that many of the masonry crowns were made of left over brick mortar that is a much softer material than the properly required harder concrete that is needed to protect the brick on the chimney masonry. 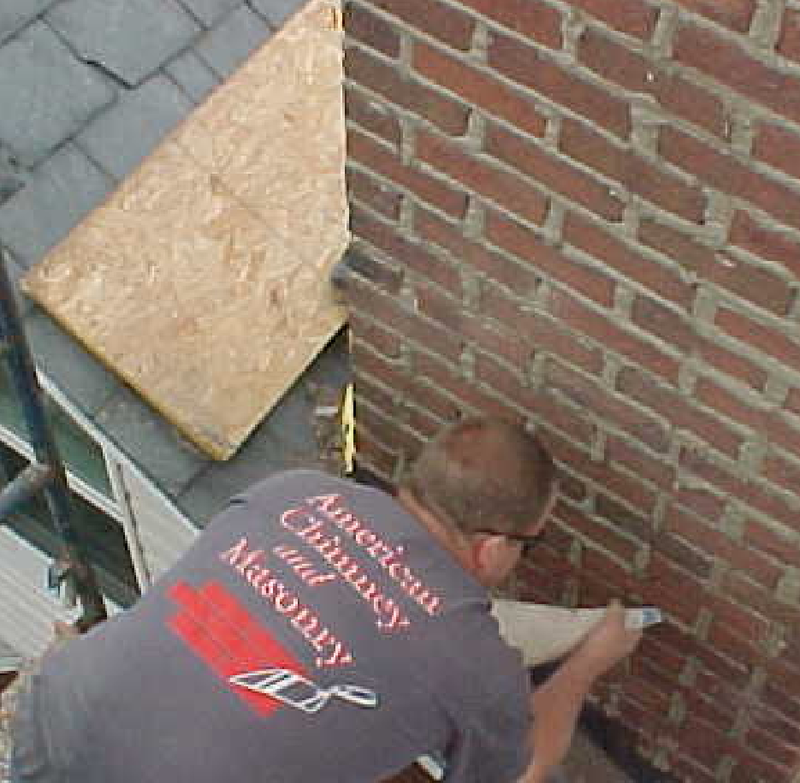 -Masonry tuck-pointing is the process of replacing damaged or worn out mortar joints from the bricks on both the chimney and any other masonry surface of your home. 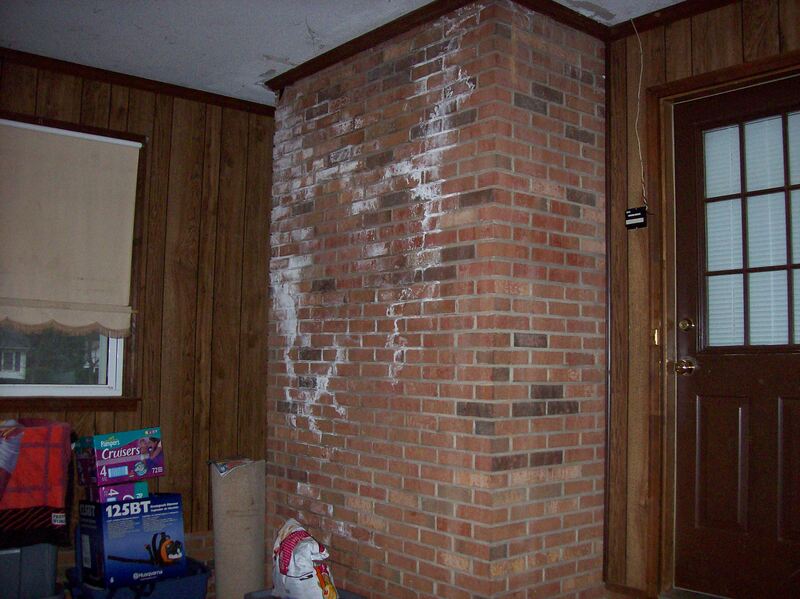 This is often a big problem that is found at the top the brick chimney. As well as what’s referred to as the corbels, which are hips or shaping on the outside of the chimney. Again moisture is not your homes friend, as over hanging tree branches, and shrubs laying up against the house brick can bring big problem. 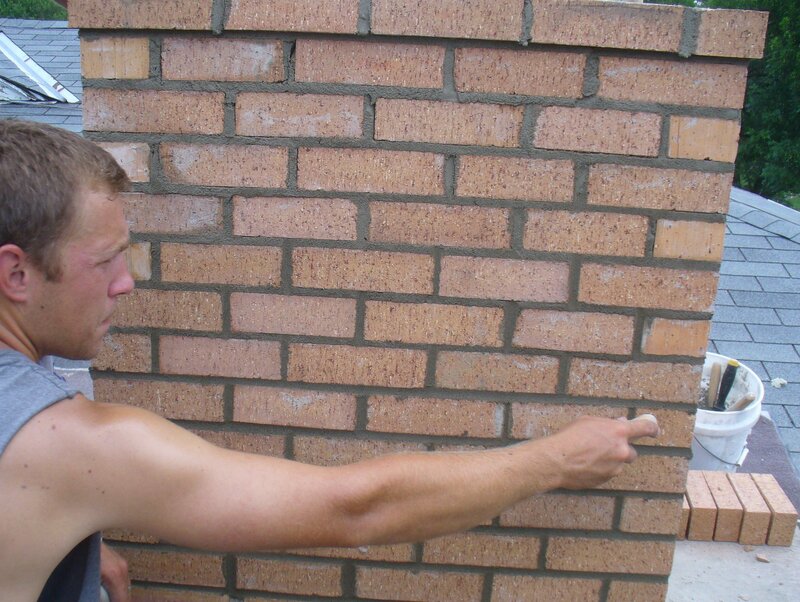 The same is true as we watering our yards and shrubs in the summer, as well as repeated water sprinkling of the masonry brick surface over and over is very damaging. My 3rd and final area of concern; is the internal working of the chimney flue system. The flue system is designed to move hot gases from the hot water heater and furnace. For every 100,000 BTU of natural gas used in your home it will generate about 1 gallon of water. This moisture has to go somewhere, either up the chimney or it will condensate and leak back down into your home. 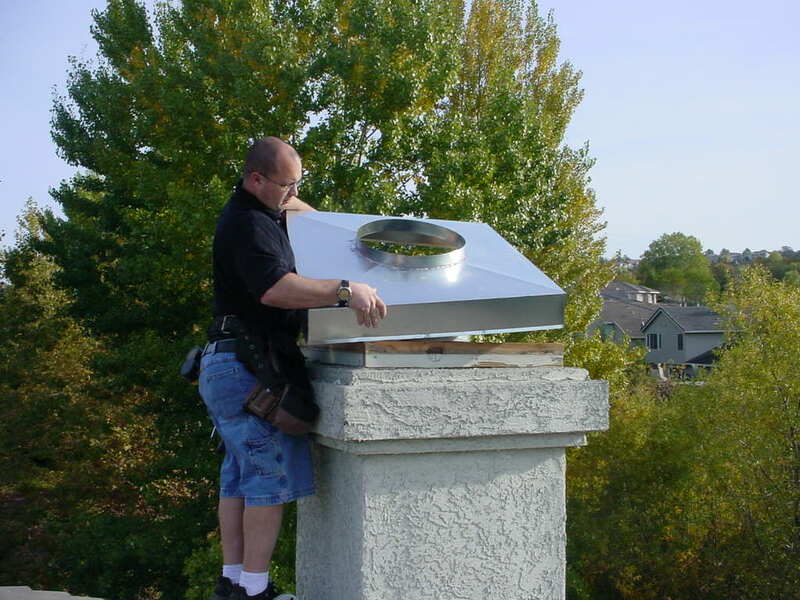 Your Chimney flue may have be improperly sized for a new furnace or hot water heater replacement. It’s now possible for it to run out onto the basement floor. If the chimney flue blocks this, it will also cause condensation water problems. You may ask what could case this blockage. It could be broken chimney flue liners or bird nesting blockage. This is why we always recommend a properly sized chimney cap along with a bird screening on every chimney top. To sum all of this up , we have identified the chimney leaking water problems. I have offered you some reasonable solutions. Now picture this with me, you have had a very busy day, your rather tired. It is 10:30 at night, you shut the TV off and you’re locking up the house. As you prepare to go upstairs to bed, then you hear that voice coming from upstairs saying. Great description of potential issues. Wish you lived in Florida we are having a tough time getting info and inspections done on a chimney for a house we want to purchace. I feel that it is very wise to have your fireplace inspected prior to purchasing this home. May I suggest finding a reputable Chimney Sweep in your area, by using this link to the National Chimney Sweep Guild locator: http://www.ncsg.org/search. Also be sure to go online and read their customer reviews, from Google, BBB and AngiesList. I hope that you enjoy your new home. as a Level 2 Inspection is often required when selling or purchasing a home. I recently had a custom metal chase cover installed to replace one which had rusted out and was leaking. Shortly after the installation we had a heavy rain. When I got home that evening(the rain had already stopped) I heard a steady drip for several hours, which indicated to me that quite a lot of water had pooled somewhere, Due to pending interior repairs the wall is open and I could see the water was coming from inside the chimney, I have a new roof and there are no signs of any leaks related to flashing problems. I contacted the chimney company and they came out to check into the problem. They conceded that they may need to reseal the collar on the chase cover, but indicated the problem was more likely water seeping into brick and said they could apply a water repellent. I can understand a porous material like brick will absorb water, but it doesn’t seem logical that so much water is absorbed through the brick that it would cause a pool large enough to drip within the chimney for several hours. There is minimal discoloration on the upper 2-3 rows of brick at the very top of the chimney. The condition of the brick appears to be very good. 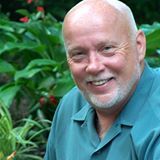 I live in Florida so humidity is high and rains can be frequent although not usually long in duration. Chimney company wants over $1000 to clean and treat with water repellent, which seems extremely high to me. I’m skeptical that water absorption is the main cause of this pooling and given the expense, I’d like to have another opinion. Is it common that enough water would absorb through the brick to cause 5 or more hours of a steady drip? Thank you for your opinion Mr. Lamb! I hear that reluctance in your words of using this same chimney contractor! He “may or may not” be truthful or maybe it is a communication problem in his outlining the amount of work involved to complete the job, as well as the value of water proofing material products that they may be recommending. Remember it is your home and you shouldn’t feel bad or threatened about calling other contractors to compare pricing. I never assume just because we did part of a job that we will get or deserve the other piece of the puzzle. Lets talk about the open cavity that you mentioned. I would ask all of the contractors about water testing. Without seeing your particular situation it sounds like this is a perfect opportunity to do some water testing. Ask about trying to introduce water leakage into the home by doing controlled water soaking. We always start water testing from the outside and starting at the lowest point possible and then slowly work our way back up the roofline as well as the chimney chase. As a side bar, using one man outside with a garden hose and the other inside, often in the attic and working with two way radios we have quickly discovered where the water entry was. Don’t forget the water entry can be way up stream of the rooftop and then often works it way down to the chimney area. 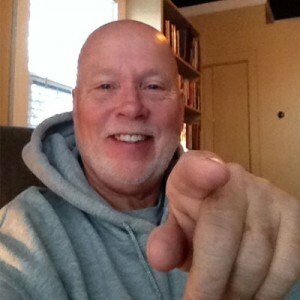 Hope this helps and I want to thank you for your question, as I’m sure it will help many others. To find a reputable Chimney Sweep in your area, use this link to the National Chimney Sweep Guild locator:http://www.ncsg.org/ and be sure to go online and read all of their customer reviews from Google, BBB and AngiesList. Please except my sincere apologies for this late reply as I have been out of commission helping my daughter while she was undergoing spinal neck surgery. I agree it is in my opinion the collar around the pipe on the pan is the only place the water might be coming in from the–> top. If this issue has not been resolved I would recommend water testing, I would start working low on the chimney and soaking all areas and slowly moving upwards to the top! *Take a look at our Ask The Chimney Sweep video, as It may be of help!